Pro tip: it isn’t there. The following is a post/article forwarded to me by u/alphabetcereal on Reddit, detailing some statistical analyses he performed related to the link, or lack thereof, between gun control laws and gun deaths. He requested I reprint it. I found it interesting, and I share my opinions at the bottom. In 2013, a peer-reviewed article supporting gun control appeared in JAMA (Journal of the American Medical Association) Internal Medicine. Following its publication, a variety of news sources reported on the article: MedPageToday | Reuters. It should come as no surprise that gun control advocates are championing this as overwhelming evidence for more gun control. Dr. Fleegler used data from the Brady Campaign to assess the strength of gun laws for each state. His methodology involved condensing these gun law scores into four equal categories, what are known as quartiles. The bottom quartile are states with very low gun control, and the top quartile are states with high gun control. His central argument is that states with high levels of gun control appear to be “safer” in terms of firearm homicides and suicides, and that the difference, in comparison to very low gun control states, is statistically significant. While these quartiles are never given specific names in his research, for the sake of convenience, I labeled them as: very low (Q1), low (Q2), moderate (Q3), and high (Q4). This also makes the visualization of said data more intuitive. The medical news site MedPage Today discussed the supposed benefits of the increased regulation on gun ownership. “The lower rates [of gun-related fatalities] applied both to homicides and suicides… Nearly all the difference was concentrated in gun suicides, in which the difference between top and bottom quartiles was 6.25 deaths per 100,000. The difference in homicide deaths was 0.40 between top and bottom quartiles.” Overall, Dr. Fleegler is quite adamant about the effectiveness of gun control. According to his conclusion, the lack of “tough” gun control in certain states appears to have a strong connection with high rates of firearm fatalities. However, I’m often reminded of Mark Twain’s famous quote, There are lies, damned lies, and statistics. First, let’s examine the issue of firearm homicides. It is worth pointing out that Dr. Fleegler removed three states that have both low gun control and very few firearm homicides: New Hampshire (Q2), Vermont (Q2), and North Dakota (Q1). He claimed that the CDC did not have a mean rate for 2007–10. However, I accessed the CDC/WISQARS system and discovered that they do in fact have aggregated rates available for those three states. Therefore it seems rather strange that he would exclude them since their absence could easily skew the results. In order to examine his findings, I retrieved his data from the JAMA article, specifically the gun law scores and quartiles. I combined this with the CDC/WISQARS data including the missing states, and additional data from CDC/BRFSS and the Census Bureau to use as control variables. I conducted two tests: the first was a one-way ANOVA with firearm homicides by gun laws. No significant differences were detected among the quartiles. When North Dakota is re-added into the lowest quartile, the difference in relation to the highest quartile was only 0.10 firearm homicides (per 100,000). In the second test I used regression analysis to control for several possible factors. This included state-level percentages of gun ownership, poverty, unemployment, college education, and population density. Still, no significant differences were detected for gun laws. What this all means is, there is really no difference in the firearm homicide rate of a state regardless of how much or how few gun laws they have. Next, there is the question of firearm suicides. This analysis followed the same sequence that was applied to firearm homicides. The results of the one-way ANOVA indicated that there were highly significant differences among the gun law quartiles. For example, the difference between the lowest and the highest quartile was 5.67 firearm suicides (per 100,000). At first glance, the outcome would appear to agree with Dr. Fleegler’s findings. However, when you control for other variables, the significant difference between the lowest and highest quartile essentially disappears. From the regression analysis, each quartile coefficient (B) represents an adjusted value for what the difference in firearm suicides would be if the effects of other variables were removed. Based on this model, the difference between the lowest and the highest quartile has changed from 5.67 firearm suicides (per 100,000) to an estimated difference of only 1.73 firearm suicides. It should also be noted that gun ownership is the variable which removes the significant association between gun laws and firearm suicides. Dr. Fleegler even admits in his journal article that this may be a confounding variable. But, regarding gun ownership, I do not believe there is something about having a gun that increases one’s risk of suicide. In many ways it is purely tautological in that, to kill yourself with a gun, you must first own a gun. This is why it should not be unexpected that areas with more gun owners tend to have more gun related suicides. Since there is no solid link between gun laws and firearm homicides, those who favor more gun control legislation are very quick to point out the relationship with firearm suicides. 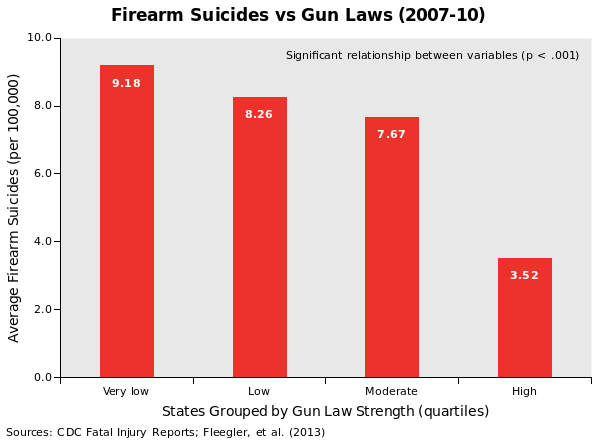 For example, Fleegler even argued that more gun laws could lower firearm suicides by reducing gun ownership. However, his gun law quartiles really seem to be capturing an overall type of health risk that is in all probability not related to gun legislation. 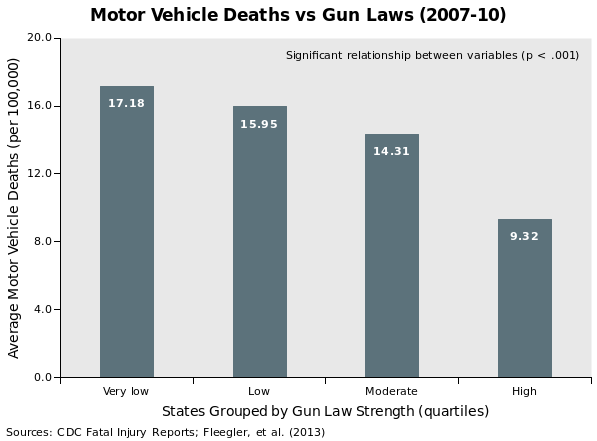 For example, I found a highly significant association between gun laws and motor vehicle deaths (per 100,000). In a different analysis I also found an association with drowning and poisoning. Most likely, states with low levels of gun control were already more prone to both accidents and suicides due to a number of social and environmental elements. 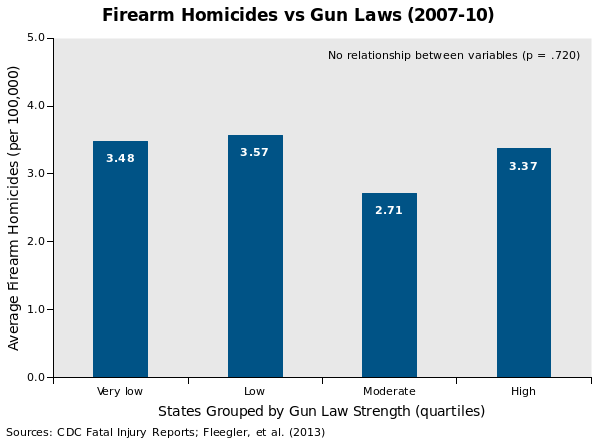 While it should be obvious that gun laws do not have any bearing on motor vehicle deaths, this skepticism is rarely applied to suicides by researchers like Dr. Fleegler. Finally, there’s one more thing I should mention. His study was funded by the Joyce Foundation, an organization which lobbies for more gun control. Could you imagine using the results of a paper funded by the NRA to debate with a pro-gun control advocate? See how well that goes over. I find this analysis to be reasonable, and what I would expect based on my own dives into this data. I do, however, want to make what I consider to be one important correction, and then elaborate a point about confounders. As we spoke about in the second article, overall suicide rates do track with gun ownership rates across many states, but only in men. (link below) What’s missing from Dr. Fleegler’s account, and also missing from the above critique, is a more introspective look at causality. States with higher gun ownership are less likely to pass restrictive gun control laws, purely because voters vote in their own best interests. Both the Fleegler study, and the above critique, are likely reflective of a completely different causality mechanic. The gun ownership rate itself is the cause, while slightly higher male suicide rates and more restrictive gun laws are both effects.